Vatican Jewelry CLOSE-OUTS from The Vatican Library Collection! 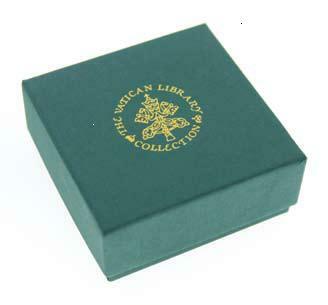 Unique Catholic Jewelry presented in classic, green gift boxes with a gold embossed Vatican emblem. All Vatican Jewelry comes with a FREE Catholic Rosary and a FREE Collectible Vatican Postcard! THE VATICAN JEWELRY IN THIS SECTION ARE VERY LIMITED QUANTITIES. ONCE THEY ARE SOLD OUT, THEY ARE GONE, AS THEY ARE DISCONTINUED TREASURES... GET ONE WHILE YOU CAN!